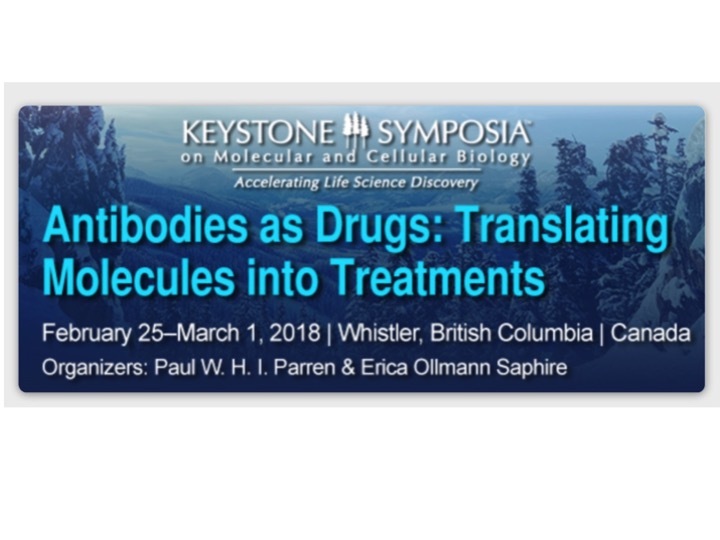 The Keystone Symposia Antibodies as Drugs: Translating Molecules into Treatments was highly successful with many outstanding scientists presenting lots of new data. We welcomed 246 attendees including 28 speakers, 28 students and 21 postdocs from 22 countries. The focus on understanding antibody specificities and mechanisms in protection against infectious diseases and drug development in cancer provided an interface that gave us access to novel information and generated new insights. Excursions to new findings from antibody mechanisms in CNS and cardiovascular disease complemented the picture. Particular highlights included Dennis Burton’s Keynote lecture on reverse vaccinology, which envisages vaccines that induce neutralizing antibody responses by a multi-step approach that elicits the development of antibodies with the right germ-line configuration followed by boosting and polishing to induce their maturation into protective antibodies. He furthermore introduced the concept of broadly neutralizing ‘super’antibodies with application in prophylaxis or therapy of HIV-1 infection. Antonio Lanzavecchia described the existence of novel functional antibodies in human antibody responses. These antibodies contain insertions borrowed from human proteins. Antibodies with insertions of part of the LAIR-1 protein, for example, were found in the immune response against Malaria. Interestingly, insertions may not only occur in the HCDR3 region, but also precisely situated in the elbow between the VH and CH1 domain creating natural bispecific antibodies. The importance of antibody Fc-mediated effector functions for protection against viral and bacterial infections as well as for the activity of therapeutic antibodies against certain cancer targets was avidly discussed. The recruitment and activation of myeloid cells and complement by antibodies was mentioned in many talks, putting a novel spotlight on these innate effector functions. Galit Alter showed that humoral profiling identified neutrophils and complement activity to predict reduction of the viral reservoir in HIV-1. Marjolein van Egmond stressed the role of IgA in inducing migration and activation of neutrophils and its potential for immunotherapeutic approaches. Hexamerization of antibodies after binding their target on cancer cells or pathogens was discussed. Hexamerization of antibodies is recognized as a novel effector function of IgG, which is important in the activation of complement. Interestingly, mutations that enhance hexamerization of IgG can be exploited not only to enhance antibody effector function, but also to drive clustering and activation of target antigens such as DR5 or OX40. The importance of marrying the right antibody format with the right specificity to obtain optimal results was discussed by Janine Schuurman. It has become clear that simply combining antibodies with the best properties often does not generate the best combination. Designing bispecific antibodies as well as antibody cocktails requires the empiric screening of combinations for function in order to generate the most effective product. A number of exciting and useful new tools were described. Jan Terje Andersen described an endothelial cell –based recycling assay (HERA assay) to analyse FcRn-recycling of antibodies impacting their in vivo half-life. Pierre Bruhns showed data for a novel method, called DropMap, for single-cell phenotyping and isolation of IgG-secreting cells that provides insightful information on IgG affinity and secretion rates. Bertrand Routy showed how good bacteria help fight cancer. In a study, recently published in Science. He demonstrated that the use of antibiotics reduces the efficacy of PD1-targeting immunotherapy. Patients harboring low amounts of Akkermansia muciniphila bacteria, furthermore, responded more poorly to PD-1 blockade, while supplementing these bacteria to mouse cancer models increased responses. A healthy gut flora may therefore impact responses in immunotherapy of cancer. A number of speakers stressed the importance of antibody-mediated effector function in checkpoint blockade for antibodies against targets that are highly expressed on T suppressor cells. Examples include CTLA-4, OX40 and CD25. Finally, we discussed the exciting area of delivering antibodies with DNA- or RNA-based techniques. Sarah Elliott showed that injection of plasmid DNA-encoded antibodies protected against Influenza virus A and B infection. Markus Schmid demonstrated the effective adenovirus-mediated delivery of DNA cassettes that could harbor multiple antibodies as well as cytokines. By providing the virus particles with a DARPin-based targeting moiety and a scFv capsid-shield strongly increased specific targeting and prevented the binding of neutralizing human anti-adenovirus antibodies. Ugur Sahin and Johannes Lutz described in vivo RNA-based antibody delivery technologies to express bispecific T-cell engaging antibodies that reduced tumorigenesis and full length antibodies that protected against rabies virus challenge. John Lambert ended the meeting with a keynote lecture discussing the concept and state-of-the-art of Antibody-Drug Conjugates.